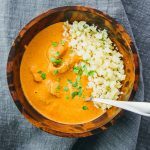 A quick and easy recipe for Indian butter chicken, yielding a creamy orange sauce with yogurt marinated chicken. Combine marinade ingredients (yogurt, garam masala, lemon juice, pepper) in a bowl and mix well. Add chicken chunks and thoroughly coat with the marinade. Let sit in the refrigerator for at least 1 hour. Add chicken chunks (along with the marinade sticking to them) to a 3-quart or larger pan over medium-high heat and sauté until the chicken is mostly cooked, about 5 minutes. Add butter and garlic to the pan. Stir until the butter is melted, a few minutes. Add tomato sauce, heavy cream, garam masala, paprika, and cayenne. Stir to mix well as the sauce comes to a simmer, a few minutes. Cook for 20 minutes to thicken the sauce, stirring occasionally, reducing heat as needed to maintain a simmer. Serve with cauliflower rice, basmati rice, or naan. Garnish with cilantro or parsley. This recipe yields 7.5 g net carbs per serving. Nutrition information does not include rice or naan.